As we finished walking through the apartment we wanted to buy in Medellín’s El Poblado neighborhood, Mike, my husband, turns to me and says, “Honey, trust me, it will be perfect once we just do some renovations.” My palms get sweaty and I swallow hard. He wants to renovate? I didn’t like the idea of renovating our home back in the States where I knew the language and the regulations. Why on earth would I want to renovate a property in Colombia? However, I soon came to realize that buying an apartment in a 15- to 20-year-old building and renovating it to bring it up to your taste and style is really a great strategy. Apartments in older buildings usually have more square-footage, are less “cookie cutter,” and most importantly are 20% to 30% less expensive than buying new. We went ahead and bought that apartment for $175,000 back in 2013. Renovations were completed on time, on budget ($37,000), and with minimal headaches. Let me share some tips we learned as renovators. Colombia doesn’t have many English-speaking contractors and tradesmen, but don’t worry if your Spanish isn’t quite as good as you’d like it be. When my husband and I renovated our apartment five years ago, neither one of us had a particularly high command of the language, but we learned a few tricks that helped us communicate better with the workers. You do need to have some basic Spanish vocabulary related to building, so create a vocabulary list of common words such as wall: pared, floor: suelo, more: más, and less: menos in both English and Spanish. This way both you and the worker can point to the words you are trying to convey. Write down numbers so there is no confusion. Tres (three) and trece (13) sound very similar. And hand gestures go a long way when explaining what you want. Simply pointing to an existing wall outlet, holding up three fingers, and then pointing to where you want the new outlets to go and marking them with blue painter’s tape worked perfectly well for us. 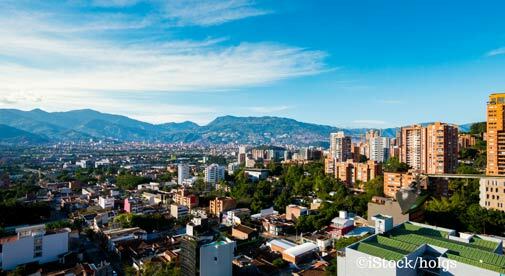 Most expats want their homes to be renovated to “North American Standards.” But what does that mean exactly, and how does it compare to Colombian standards? The range of materials and fixtures available in Colombia match that of what you will find in the U.S. However, the differences lie in design and esthetics of your renovation project. For example, in the U.S., the wiring will always be buried in the wall. Whereas many Colombians will run wiring that is visible and then encase it in conduit running along a baseboard. There can be many, many design issues that come up during your renovation project that the contractor may use his Colombian-standard-based judgement to make the decision. You can head off these issues by visiting the project several times a week to inspect the progress. The Colombian people are very polite and are reluctant to say “no” to your requests about ability to complete a project in the timeline you want. They are not being rude or deceitful, they simply do not want to hurt your feelings. You are not going to change the culture, so you just have to learn to go with the flow and make some adjustments to your expectations. The project will probably take 30% to 40% longer than the estimate, the sequencing of subcontractors will not be as linear as you expect, and you will most likely have several “do-overs”. When our renovation was in the demolition stage, I was amazed that the contractor had six men with hammers and chisels ripping up the old tile flooring. I thought, why not just use a jackhammer and one worker? The truth is that labor costs are significantly lower than the cost of buying equipment. The contractor would rather employ workers than spend his money on equipment. The downside impact to your renovation project is that subcontractors get sick, have commitments to other projects and follow “mañana time,” which slows down the work and extends the completion date. The most common complaint I hear from expats who have done a remodel is that they wished they had spent more time visiting the project to address issues. During our project my husband met the workers at the apartment every morning to go over the plan for the day, and then again in the afternoon to check on the progress. But what if you are doing a renovation project before you move to Colombia? How do you handle this while still living in the U.S? There are some expats who have started businesses as owner’s representatives. They will be your eyes and ears on the ground and report back to you in real time with pictures, videos, and phone calls during the project. Their fee is a percentage of the total project cost. It usually runs on a sliding scale depending on the size and scope of the renovation.